On my second day in Switzerland, Zürich, I was walking around the center of the city just to understand what Switzerland is like. I found myself window shopping at this vintage Patek Philippe and some Rolex Submariners. After about 7 minutes, when I actually raised my eyes to see what’s behind the watches, I saw Sean softly tapping a movement and Julian talking with customers. “This is epic.” I thought to myself. I was just about to keep walking on when one part of me told the other that I should actually go inside and strike up a conversation with them. Julian was kind enough to agree to an interview and I went back next morning to compose this article here. 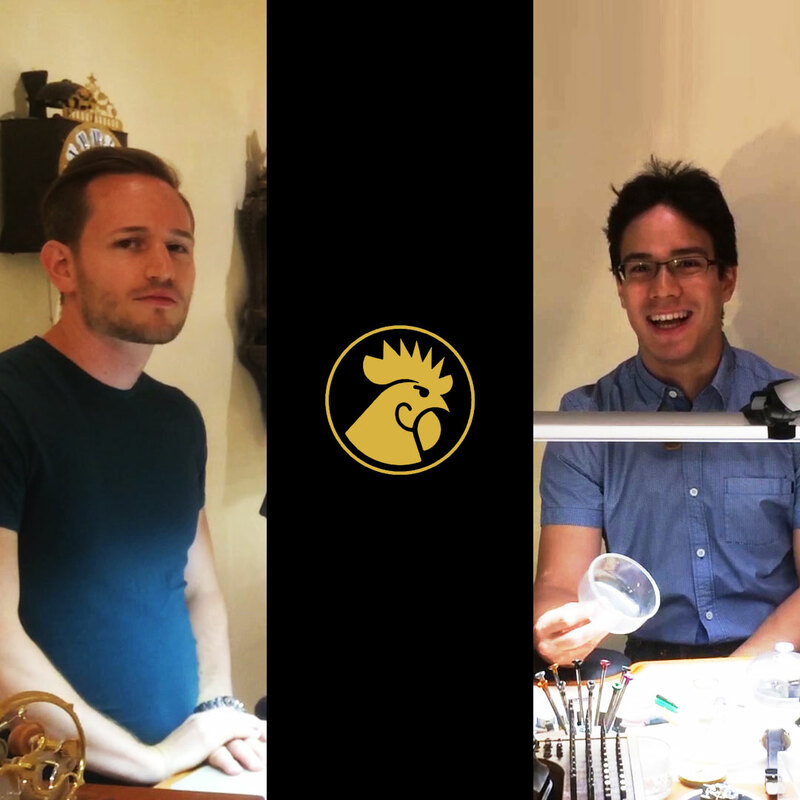 We talk about the watchmaking education, the craft itself, movements as well as trading watches online and the problems that typically follow. The article is also available in video format here. Enjoy the read. How do Swiss watchmakers usually get started? Watchmaking schools, typically. Here in the swiss-german part, there is one “big” watchmaking school which teaches 14 students per year. The degree takes 4 years to finish. This is one way to learn watchmaking – at the school like I did it. An alternative is to learn the profession by apprenticing in a store, which also takes 4 years. That’s how Sean did it. Therefore we both took two different paths to learn the same thing. So you are more classically schooled, and in addition to that, watchmaking actually runs in your family, so this must be a helpful package? Yes, haha, both my parents are watchmakers, actually. When I grew up, we had a watchmaking shop downstairs and we lived upstairs. There were always a lot of watches and clocks around. Usually, Swiss watchmakers have family connections to the business or are tied to the industry in one way or another. So what does the school program look like? 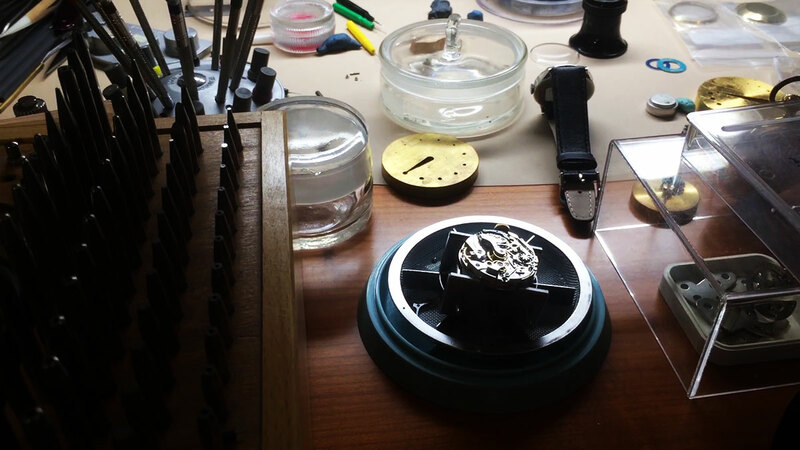 Usually 3 to 3,5 days a week are practically spent on working with watches. The other 1,5 to 2 days a week are for theory, which always takes place in a school. The practical part can be done as an apprenticeship in a workshop, however. So that’s how Sean did it – practiced as an apprentice in a shop and then came to school for the theoretical part? Yes, exactly. That’s where we met, actually – at school. So after 4 years, you’re only at the beginning of the career. You know the basics, but not much more. There are so many different movements, complications, and solutions to problems, that after 4 years you’re still going to be learning every day. It’s not something you can just pick up and learn throughout by yourself. You can’t do it. You will break more than you can solve. Vintage watches don’t come with a manual, do they? Yes, you need to have the experience to know how to do it. After that, you must know what are the methodologies to solve the new problems you will always get into. You can’t just replace parts for vintage watches because they’re not around anymore. You just have to work with what you have, so if there’s a broken balance staff, for example, you have to fix it – you can’t just replace it like you can with new watches. You must know how to measure and produce the whole thing. And often there are several different ways to do it. Like with a balance staff – if the pivot is broken, one option is to put in a new pivot, to make a new balance staff, or create one from some other balance staff which is similar in size by shaping it to the correct size. Do you produce the parts right here in your shop? Yes, actually. This is why we launched the shop here – not just to sell the products, but to work on them, service watches and have a complete workshop with all the tools necessary. So the watches you display here – how do they end up here? It always depends from watch to watch. We often buy the watches and service them completely and then resell them here. Most of the watches you see here are from the 30’s to 60’s. So they’re quite old and the conditions can vary greatly. A lot of watches from that era are screwed up, with damaged movements or rusted parts. So we pick out the best ones. Then we service and fix them and sell them with a Faktor Zeit guarantee. Often we see two watches that are exactly the same, from the same era and everything – but one is basically worth almost nothing because it got wet, it was worn too much without any service and the other one is like new. When a watch doesn’t get serviced, it’s amazing that it can run for such a long time. The worst that a watchmaker can do is just drop some fresh oil on a movement that hasn’t been serviced for a long long time. It can look like the old oil has disappeared and just evaporated, but old oils actually gunk up and get stuck in the movement somewhere. That’s one of the main reasons why a lot of parts get worn out very badly and that’s where the problem starts. If it is a very rare movement, you will have a really hard time finding the replacement part. As an alternative, you can just make it by yourself, but many people are not able to do it and some can be tempted to make some bad compromises. In the end, for a conscientious watchmaker that becomes a big pain. There are so many places where you can buy worn out watches or watches that are not good anymore. Almost all of these watches haven’t been serviced when you buy them. So unless you are an expert, as a customer you don’t often really know what you get. As you said, you can have two watches that basically look the same, but the movement inside can be like night and day. This is something that a typical person buying a watch from eBay would not even think about, right? Exactly. You just can’t tell online. Even we can’t tell. This is why we never buy watches online. Even if we can see a lot from pictures, we can’t see it all from pictures, so this is why we never buy watches online. We want to have them in our hands, look at the movement, the dial, the case, before we decide if we want to have it or not. There are so many things that can go wrong with online watch purchases that it’s hard to count. What do you recommend to people who would like to trade watches online for profit or just acquire some valuable timepieces? What are some safety nets around that or are there none? This is really hard. I would say that there are two things you must know. First, you must know the history of the watch throughout. When was it produced and does it have all original parts that match with the original production? The other one is the condition, which is super important. You can understand the full picture only if you are a watchmaker and are actually holding the watch in your hands, really. If you buy a watch online there’s just a huge risk that the watch is not fully what its title claims it is So it’s super hard to get an idea of what you get when buying watches online. So just buying and selling watches on eBay and other places like that is not as easy and simple as it sounds. You have to go to school and get a decent understanding of the expertise required to start understanding what is actually going on with the watch. Yes, I recommend to find a watchmaker that you know is good and work together with a guy like that. Trust is a very important aspect of trading watches, especially with vintage watches. Newer watches are a bit easier because when you buy a new model online or the store directly, you can have more confidence in the fact that it’s in good condition. Reversing the trade is extremely hard online. I’ve another question. What kind of stories do you have from working with watches that you can remember? Some watches that have a crazy story or something that you discover only when you open the watch? There are quite a lot of stories. Of course, there are quite a few people that walk in with fake watches, people who even paid more than the list price for a fake watch. Sean, you once bought a really good-looking Omega online, right? Yes, so it looked like steel, but it actually turned out to be a bronze case that was chromed. Obviously, you couldn’t tell from any of the pictures. When I had it in my hand, I instantly realized… That’s not steel. Yeah, it had all the stamps of Omega inside, so you can’t really tell. On the pictures, it looked like an original solid case. But when it arrived we instantly realized that it was a complete fake somehow. The movement was correct, but the case was fake. So with watches like that… You can’t really sell it anymore, so we lost some money. That’s always a pain. Better not to even get into that kind of situation. It’s much better to see this kind of issues before you buy, it makes your life so much easier for sure. To verify the watch and the seller first, right? Yeah. It’s so hard online. And you know, to get the money back from online purchases, a lot of times it doesn’t work. Even if you have the proof or a guarantee, it doesn’t work somehow. So this is a good example of what you can’t see with watches online. Obviously, we don’t want to sell watches like that, so we just took the movement for spare parts, but it’s not what we wanted to have. Collectable vintage watches, especially Rolexes, are super hard to work with. Rolex because there are so many small differences which make a big impact on the price and the collectability of the watch. It’s a big pain for us, of course super interesting, but painful because you need to get really deep into the field to know all these differences and to know which ones are good. If the dials are correct, et cetera. Whether it’s an original dial that got serviced and replaced, or if it’s still the old one. Also the Marks. If it’s a Mark 1 dial, Mark 2 dial – you need to know when it was produced and if it matches the case and movement. There are so many things you just need to know. Sometimes we spend days to analyze whether we want to buy a watch or not and learn a lot in the process. Once we had a Submariner 5512. From the end of the 60’s or the beginning of the 70’s with box and papers. It looked beautiful. At first, we thought that this will be the thing we want to have. Then we started researching and found out that it had all original Rolex parts, was in great condition, but it was in the wrong calibre. Rolex made different calibres which were almost the same, but not exactly. So in the end, that Submariner somehow had the wrong movement inside. Everything looked perfect, it had the papers, the box and all, but it was not in original condition. So things like this are really hard to find out and we found out only after a whole day of researching this. Of course, it’s super interesting and we learn a lot, but it’s sometimes hard to deal with it. So after the day or two has passed, that deal is probably not going to happen, huh? Sure not. That’s the thing, this is why we take so much time just to look at it. It’s very important. Even if we don’t get paid for it. It’s all to have great watches in here. Even if most people wouldn’t even understand the difference, we still don’t want to do it and that is why we spend so much time just to analyze and look at the watches. This is the high level we want to keep. And with vintage watches, you know, most of the traders are not watchmakers. So they know a lot about the history, about the cases and dials, but they don’t typically know much about the technical part. The movement is still the heart of the watch, which I think is the most important part. You can have a nice case, nice dial, but if the heart is wrong, it’s wrong. I don’t want to sell it like that. So this is our philosophy when we deal with watches. Less quantity and more quality. Alright. The Swiss way, huh? Yes, as a watchmaker you want to do it like that. What do you think, how did that movement get into that watch? That’s the thing, you never know actually. Especially with very collectable watches, you can raise the price so much by just doing small little things. For example, if you make a watch older than it is, it can be much more valuable. In this case, the old movement possibly got wet or a careless watchmaker worked on it, who damaged the movement and then swapped it. This is why it’s important that everybody who works on watches really gets the right education so they know what they are doing. We see so many watches that have been scratched from the inside – and this happens only by watchmakers or somebody who tries to work on it. So this could be the case with that Rolex as well. Someone messed up the old movement and just swapped it to hide the fact. But we’ll never know. And of course, there are people who want to just sell a nice watch. Either they don’t know about the wholeness of the watch or they just don’t care about it. Most people don’t see the difference, but we do. Sometimes we also discover hair inside the movement, which has gotten very tangled in all the wrong places. Also hair around the hands, et cetera. Can you tell me about this movement that you have here on your bench? That’s one of the best chronograph movements ever made, in my opinion. It’s the Longines 13ZH flyback chronograph. Longines produced very high-quality movements, but what I like as a watchmaker is that it’s nice to know that a watch brand has produced everything in that watch by themselves. Longines started to produce chronograph movements very early compared to other big brands like Rolex of Patek. They had an amazing quality of movement construction since the beginning. So for me as a watchmaker, there is nothing better than an early Longines chronograph. And of course, it’s always a pleasure to work with something that is nicely made – I mean who wants to make bad work? I don’t, so I always have a lot of fun while working on a Longines chronograph. Obviously, they’re never easy, but very cool. Here’s another one. This is the 13.35, made in the 30’s. The rubies seem to be a much deeper red somehow. What’s nice about this movement is that it has a jumping minute counter, like Lange has today. Rather than sweeping evenly, it jumps to the next one at every full minute. Of course, this involves much more parts and everything that has more parts has more cost. They actually stopped producing this after this calibre. After this one there was the legendary 13ZN, which was the last chronograph Longines produced by themselves. So, in chronological order: 13.35, 13ZN and 13ZH. Whenever Longines chronographs are in great condition they’re really cool. Especially in your hands, huh? Yeah. That’s because I like nice things. Alright, guys, any last things you want to say to aspiring watchmakers around the world? It’s a super interesting field. Especially vintage watches. Most people start with newer watches, and when they’re ready to go a level higher and start working with vintage watches because there’s so much history behind it and many developments which are super interesting. 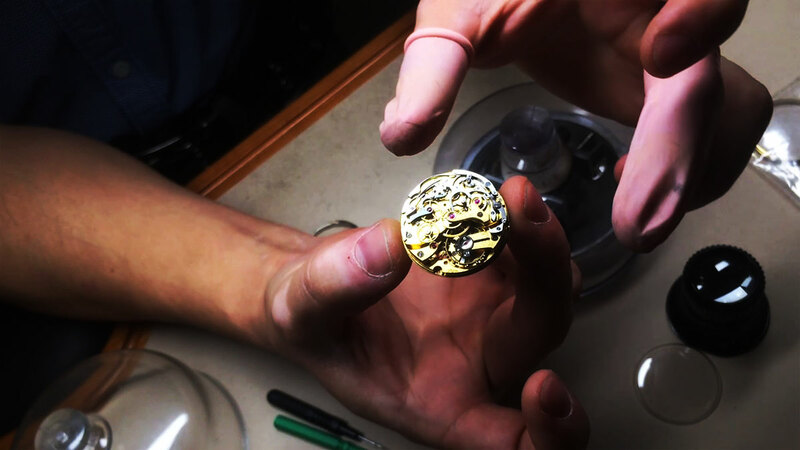 It’s very important to establish a foundation of watch mechanics because that’s really at the heart of every watch. The most important part to understand. Julian Kägi and Sean Fuchs at Faktor Zeit. 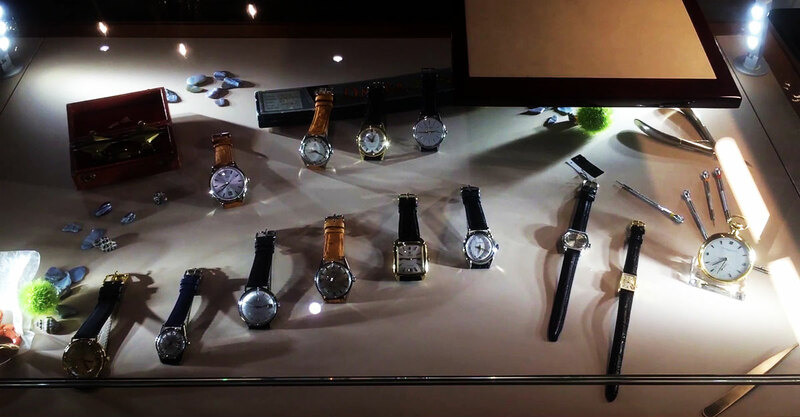 That’s the experience at Faktor Zeit, which you should definitely visit if you are a vintage watch collector or trader. It’s easy to tell that Julian and Sean are really into watches and know a great deal about vintage watches. Time with them flew quick and there was a lot to talk about.